There is no exemptions for CFA exam as far as I know. Once you start on your CFA journey and pass the Level 1 exam, you start to enjoy the various waivers that you can get from other professional exams and certification. Most of these exemptions are related to security trading, investment advice and portfolio management. You can also gain CPE credits for certain professional qualifications such as the US CPA. Regulations change from time to time. Please check out the latest regulator recognitions here. CFA Institute is a CPE sponsor registered with NASBA. Although you cannot get exemptions on the CPA exam, CFA courses can be counted towards CPE for your CPA designation in participating states. For details, double check with your State Board of Accountancy. CFA charterholders are exempted from taking Paper F3 of ACCA, one of the five mandatory papers/exams. You can request a waiver document by emailing recognition[@]cfainstitute.org. If you pass CFA Level I and Part I of series 16, you don’t need to take the remaining Part II of the exam. Charterholders receive a waiver from series 65. A research analyst who has passed CFA Levels I and II may request an exemption from Series 86, a qualification exam required by research analysts. Passage of both (CFA Level I and RG 146) also satisfies the mandatory Skills requirements for Personal Advice. The Comissão de Valores Mobiliários (CVM) exempts successful CFA Level II candidates from the requirements of taking the global content exams of the National Certificate of Professional Investment (CNPI). Qualification for the position of securities adviser (Ontario, Saskatchewan, and Alberta). out of various sections of the certification exams for employees of Cyprus Investment Firms (CIFs) and credit institutions. The Bologna Accords are part of a process to establish a European Higher Education Area. The general purpose of the ENIC NARIC network is to provide guidance on academic matters for those wishing to study outside their home country. The CFA and CIPM programs were benchmarked by UK NARIC. The Deutsche Börse AG accepts the passage of Level III as fulfillment of the professional requirement necessary to be an exchange trader. To those who have passed level III, Capital Market Commission (CMC) grants waivers for licensing requirements for analysts, portfolio managers, investment advisers, brokers, and registered representatives. The Hong Kong Securities and Futures Commission accepts Level I of the CFA exam as a recognized industry qualification for investment representatives and commodities trading adviser’s representative. Bapepam-LK requires that, to operate a collective investments scheme, at least one officer in the fund must hold a CFA charter. The Qualified Financial Adviser (QFA) Board exempts charterholders from two of the six modules needed to earn the Professional Diploma in Financial Advice. The Institute of Bankers School of Professional Finance exempts those who have passed the CFA Level I exam from the Securities and Market module required to earn the Professional Certificate in Stockbroking. The Mexican Market for Derivatives (MEXDER), in conjunction with Asociación Mexicana de Intermediarios Bursatiles (AMIB), waives its certificate renewal exam, given by AMIB, for those who have passed the Level I exam. The Code of Professional Conduct for Authorized Financial Advisers (AFAs) recognizes CFA charterholders as having satisfied the requirements of Unit Standard Sets A, C, & D.
The Administradores de Fondos Pensiones (AFP) require Level I as fulfillment of SPS Regulation 114-2005 which defines the minimum qualification and experience requirements to ensure adequate technical competence of employees. The Philippine Securities and Exchange Commission requires at least one mutual fund manager in each member institution to have passed Level I. The Comissão do Mercado de Valores Mobiliários (CMVM) recognizes the CFA charter as fulfillment of the qualifications needed as an investment adviser or financial analyst. The Monetary Authority of Singapore recognizes passage of Level I as providing an exemption from several modules of the Capital Markets and Financial Advisory Services (CMFAS) Exam for those seeking a license as a fund manager or financial advisor representative. The Financial Services Board (FSB) recognizes the CFA charter as fulfillment of Category I, II, IIA, III, and IV of the Financial Services Provider’s (FSP) entry level qualification for the Key Individuals and Representatives licensing process. Passing CFA Level III (or Level I with experience) meets the requirements to be a fund manager. The Capital Markets Board of Turkey exempts those with passage of (1) Level I from the Basic License Exam; (2) Level II from the Advanced and Derivatives License Exam; and (3) Level III from the Basic, Derivatives, and License Exams. Based on its Retail Distribution Review (RDR), the Financial Services Authority (FSA) has new requirements for private wealth advisors. The FSA recognizes two CFA-related RDR compliant routes in conjunction with the Investment Management Certificate (IMC): CFA I + IMC or CFA +IMC I. The State Securities Commission has exempted those who have passed Level II of the CFA exam from requirements relating to the issuance of securities practicing certificates. Charterholders are exempt from the three year work experience requirement to obtain the fund management practicing certificate. To learn more about the details on how to become a CFA, check out our frequently asked questions page, or drop us a note in the comment box below. Best of luck to your CFA journey! Can We be More Helpful? To learn about how to study and pass the CFA exam in the most efficient manner, check out our e-course for CFA Level 1, which is completely free. You can learn about the e-course here or sign up directly below. 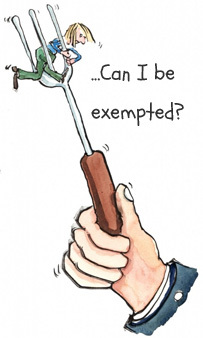 Whats there for Acca members in terms of exemption? Hi Jerry, I don’t think there is any… but you can double check with CFAI. I am a CIMA graduate and an Associate Member of CIMA. Do I have any exemption to CFA exam? I am afraid not, but you may want to confirm with CFAI directly. Hi Tey, likely not as CIMA is not in the above list (CIMA is more for management accounting which is quite different from the focus of CFA). You may however double check with CFA Institute. I have completed bachelor degree in business management and postgraduate diploma in business administration with finance modules at Auckland institute of studies in New Zealand. I have one year experience in non Audi section. I want to know that this qualification enough for entering to CPA and how I can get exempt. Hi Saman, do you mean CPA or CFA? For CPA, you can get exemptions if you are a member of NZICA, but not based on a bachelor degree (that’s the basic requirement).